The third oldest club in Sydney, Bonnie Doon began life as Marrickville Golf Club in 1897 when members played on a 12-hole course laid out in the Sydney suburb of Tempe. Ten years later, the club moved to an 18-hole course at Arncliffe, changing its name in the process of decamping to a new location. Finally, in 1947, the expansion of the Sydney airport caused the club to move to its current sandy site at Pagewood. Prosper Ellis originally designed the Pagewood course, which opened in 1949, then Ross Watson carried out an upgrade in 1995 when he built on the strength of the demanding par fours on the scorecard to fashion a formidable test of golf. In 2011, the new design partners of Mike Clayton and Geoff Ogilvy began work on stage one of a three-phase extensive redesign that involved the removal of exotic trees, the introduction of two new holes, the reworking of the current first to fourth and eighth holes and the construction of a new practice facility. In late April 2014, play began on six new holes, marking the completion of the second stage of the redesign. The final phase of work is likely to include further modifications to a few holes located in the northeastern corner of the Bonnie Doon property, which were redesigned in stage one. Founded in 1897 Bonnie Doon is a private golf club in and around two other outstanding courses, located in Sydney's eastern suburbs. Bonnie Doon GC is a quality track and once all the upgrades are done you will return to the Top 25 courses in Australia no question. The team led by Michael Clayton has been operating here with the 'refurb for a few years now and the course is almost fully completed. The course plays over rolling sand dunes and features large undulating greens similar to what was done at Royal Canberra. The new wasteland look to the course is outstanding and certainly enhances the course in the memorability category. Views of the city and neighbouring courses can now be seen through tree removal which the course well and truly required. There won't be too many occurrences where a lost ball will occur now that shrub and bush like plants have made way to showcase the true sand dune area it was born to have. I last played Bonnie Doon 25 years ago and she is somewhat changed from what I remember. That could simply be the passage of time playing tricks with my memory I thought at first, but no I was reassured to find out that in fact there was an extensive reworking of the course underway. Whilst works are not currently being undertaken, quite some works have been completed and more are yet to come I believe. In my opinion the course layout suffers somewhat from having thirteen of its holes playing almost exactly North-South, each being gun-barrel straight and therefore parallel to one another. 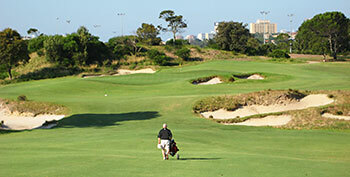 The variety is provided by playing up and down over quite distinct rises and falls in the fairways. You do not want to arrive with an uncontrolled snap hook as the first three holes all run away from the clubhouse with a boundary fence hard on your left-hand side. What I perceive to be the original holes are extremely t tight and hemmed in by ti-tree and other scrub whilst there are other holes which have a more open links like feel to them. Some of these more open holes also play diagonally across the rises and falls of the fairways rather than just up and over which make them more attractive. The members tees at 5627 metres against a par of 71 appears short on the card but seems to play longer, probably because you are often playing uphill to the greens. The card is slightly lopsided with a par of 37 on the front nine and only 34 on the back. It seems almost unfair to rate the course at the moment, as some of the new holes are still very immature in their conditioning and there is quite understandably, some disconnect between what has been done and what might yet be changed. A 3 to 4 Ball course at the moment but as conditioning improves and changes are bedded In I expect a solid 4 Ball or maybe more.